It had been the better part of a long while since I last felt nervous before an event—that “butterflies and stage-fright” brand of nerves where you are betting against all the odds of the unknown. At their most distilled point, the nerves were a good thing, signaling a hopeful sense of anticipation. And after a handful of setbacks and site changes and script edits, here we stood. Just a team of well-intentioned people and an 8 foot tall by 16 foot wide wall covered in pristine ceramic tile. Our Wall had been built, and a smile slowly crept across my face. 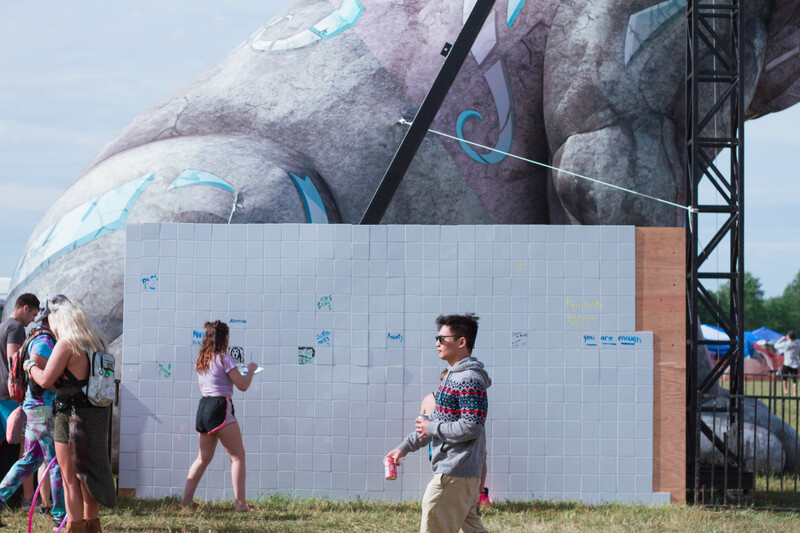 Six months ago, this wall simply existed as a “what if” bounced between our team at To Write Love on Her Arms and the creative minds behind Electric Forest. 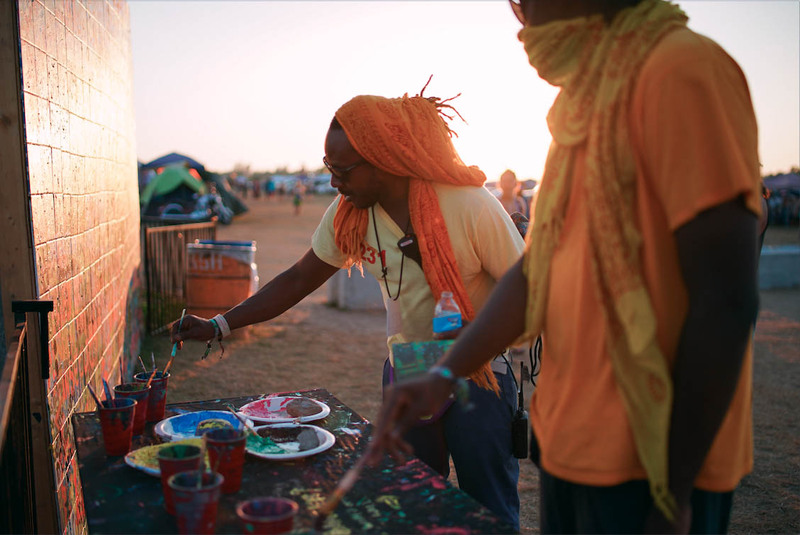 The hope was to create a living and evolving piece of art for the festival; a project where people could feel more connected, driven by a desire for authenticity. 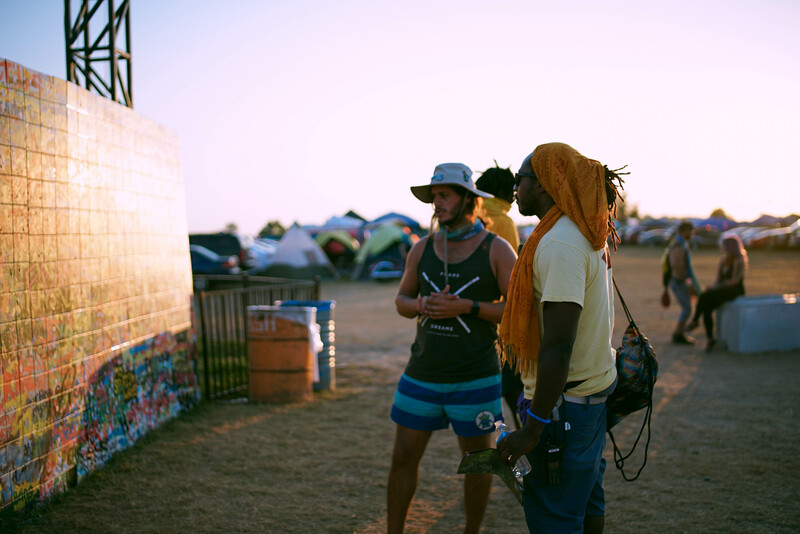 For years, Electric Forest has represented a place that encourages connection, it exists to bring people together. I’d offer that everything is welcome in the Forest except for a sense of isolation and alone-ness. But the reality is that everyone arrives with a story and a context, perhaps one that suggests we are showing up alone and apart from one another. We come with groceries and tents and clothes, but likely also with some unseen and unintentionally packed baggage. A collection of things that draw distinct lines between me and you, things that keep us feeling separated. There’s little use in ignoring, so we leaned into it by building a wall. 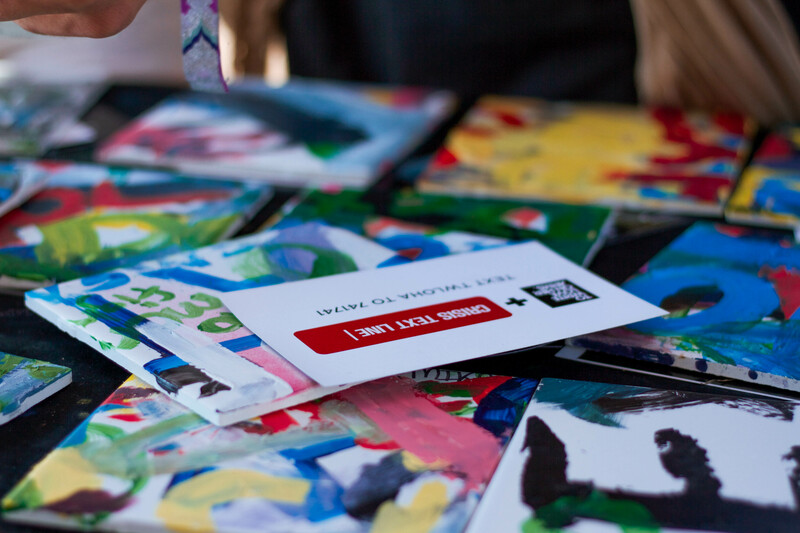 A tangible space where we invited people to paint words, symbols, and phrases representing what stands in the way of us feeling seen, heard, and accepted. We asked attendees to believe along with us that these things didn’t need to follow us into the Forest—they could be left at the wall. The wall didn’t stay blank for long, and truthfully the project didn’t require extensive explanation. People got it. They understood. It seemed as though they had been waiting for an opportunity like this, a chance to set an intention for their week. There were layers—real and poetic—of vague ideas and personal struggles. 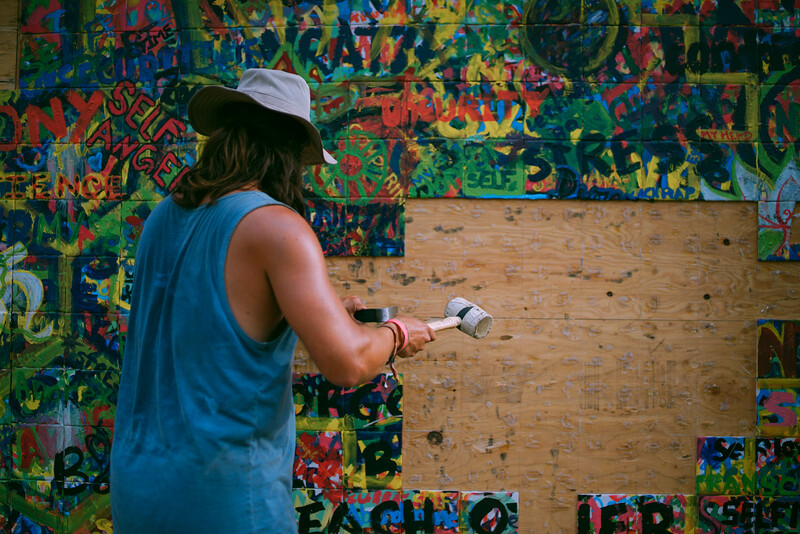 There was a sense of welcomed healing when people recognized that the very words they were painting existed in the brushstrokes of others along the same wall. For perhaps the first time in a long time, they felt less alone, and more validated in their emotions. The added catharsis came on Sunday evening, when we dismantled the wall—overflowing with the barriers that were holding us back. 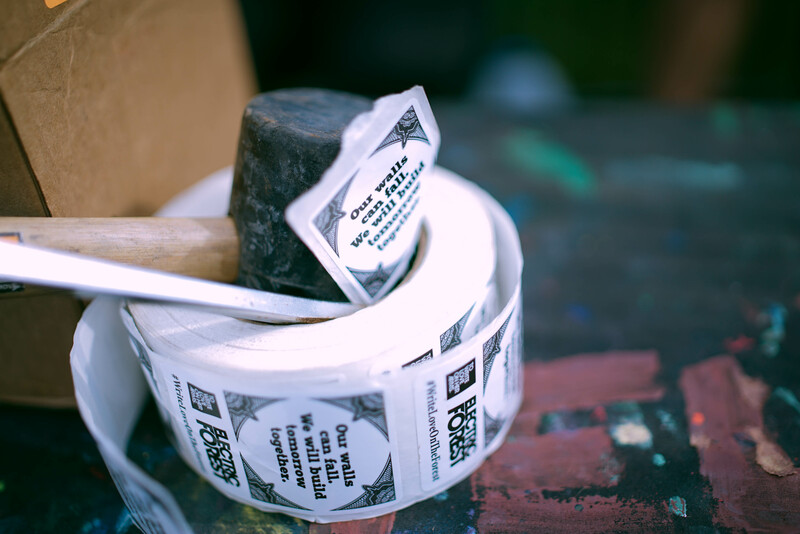 Piece by piece, tile by tile, the wall was broken down and distributed among those in attendance to serve as a reminder that the barriers in our lives can, should, and will come down. This exhibition was a part of both weekends of Electric Forest. It’s absurdly simple to say that the Breaking Barriers Project required copious amounts of work behind the scenes. And it’s equally oversimple to say that our efforts were repaid exponentially through each interaction with sighs, tears, smiles, and hugs. The last day of the second weekend brought with it some beautiful points of connection. Between the weather and the long days, I was feeling particularly run down and raw. The wall to me represented the last thing between myself and some scheduled rest, so I was ready for demolition. Unfortunately, the process of breaking down the wall didn’t run anywhere near as smoothly as it had at the end of the first weekend. This time around, we had used a significantly stronger caulk to adhere the tiles to the plywood backing, and I was given a heavy-duty crowbar instead of the more familiar and slimmer paint scraper we had used the previous week. With those factors in play, tiles began to crack when I attempted to remove them. That may not have been a problem initially, but the festival leaders had requested that we only distribute entire tiles rather than pieces for safety purposes. I was able to laugh off the first few, but as my success rate declined, the line of people waiting for a tile to take home grew. With every crack, I felt a self-imposed weight of letting people down. A few individuals had requested specific tiles and I tried my best to honor those wishes, but there was one in the middle that had a red flower that a couple had begged for. Their names were Anthony and Tatiana, and I will remember their request as vividly as I will remember the matching ache in their eyes. Anthony pulled me aside to explain that the flower was painted by Tatiana and represented her son who had died last year. I methodically pried off all the tiles around it so I could get a good angle for removal, and then decided to wait for a better tool to arrive so I could ensure it would stay intact. But then a storm rolled through causing staff to clear the festival grounds in a rush. After our team secured the booth, we sought refuge in our van. It was during that scramble that some attendees noticed the abandoned wall and began attempting to pry off tiles themselves. Flooded with worry, I immediately ran over to ask them to wait, but it was too late. The flower tile had been broken, a chunk from the upper right corner was now missing. I was heartbroken. I was livid. I was drained. And now I had to find a way to apologize to Anthony and Tatiana. When the storm let up, I returned to the wall. A line began to form once more as I started back up with a solid streak of removal that would soon fade into a run of broken pieces. It was then that I heard a kind voice. It was a woman named Mary, who called out to me: “You got this, Chad. You’re doing great work.” When a tile would crack, the voice would pipe up again, “Oh man, you almost had it. It’s OK. This is important. This all still matters.” Her cheers were moderately contagious, but it was always her voice that hit my ears first. When I finally handed her an intact tile, she asked me to sign it. The Breaking Barriers Project was intended to be a social exhibition, but it turned into performance art. I had spent the past six months trying to concisely craft an experience that conveyed how walls can come down. I had said the spiel so many times that I had convinced myself that tearing down walls was easy. But it’s not. And the reality of that tasted like tears and sweat and gritted teeth. It was Mary’s encouragement that held me together and helped me stay the course. 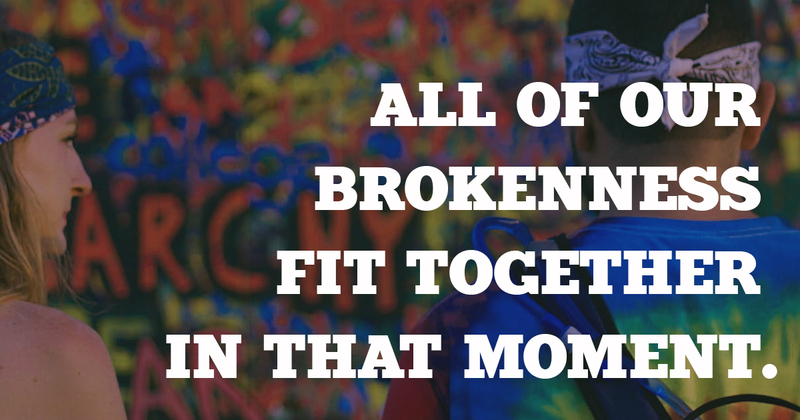 I think all of our brokenness fit together in that moment, and even for all the setbacks, it seemed right. What is true to Tatiana, and Anthony, and me, is true for you too. Tearing down walls is hard—and the truth is, it should be. Everyday we are met with what seems to be immovable obstacles. But in community, they will fall. With an audience, they will fall. With vocal cheerleaders and distant admiration from passers-by, they will fall. Looking back, it seems silly that I would spend six hours bringing down a wall for the sake of a metaphor. On the other hand, it is fitting that never once was I at work alone. These walls, they are not permanent. But the memories I take from them are. I will remember Mary. I will remember Anthony and Tatiana. I will remember Kendra, Nell, Delaina, Keets, Aneva, Erin, Kayla, Zach, Colin, Darcy, Jake, and Steve. I will remember Demarcus and Kenny and Adam. I will remember that this wall is now in a thousand different pieces, heading in a thousand different directions, to inspire a thousand continuing conversations to remind us that these walls can, should, and will come down, and that we will build tomorrow together. Chad — Many thanks to you and all the others who’ve invested the time to teach this lesson. The words in this post (and the associated photos) are absolutely beautiful . . . and encouraging. WOW you did an incredible thing with that wall. It is fitting in so many ways…for all times and for situations going on RIGHT now in the news, which involve literal and figurative walls. This post brought my heart to tears. We need to encourage each other. Be the voice that says “you can do it…keep going…no matter how hard or how long it takes!” Thank for the very real physical reminder of the walls people face and the ways people choose either to encourage and help the walls come down or discourage and build walls that were never meant to be up! This was beautiful! I needed this article as I am going through very unfamiliar places in life right now breaking down walls . 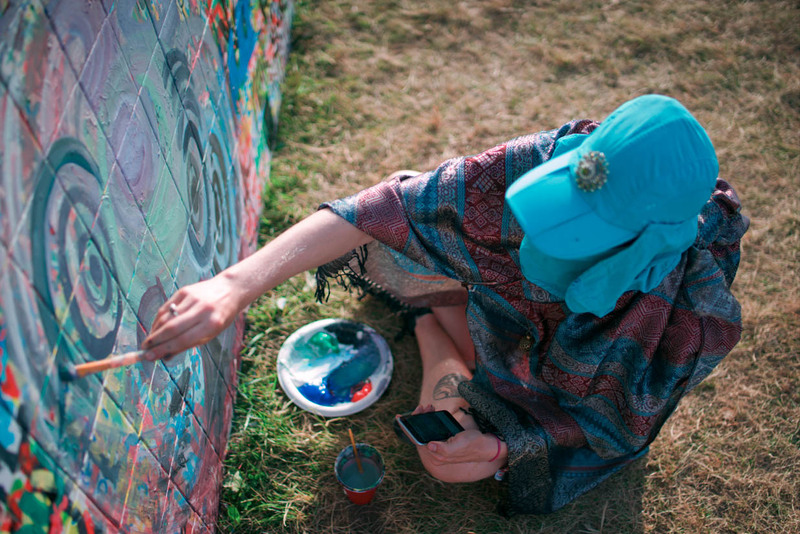 The forest was an amazing experience which I shared with amazing people , one of which painted on the Wall weekend 2 .